COLUMBUS, Ohio – A veterinarian and assistant professor of animal sciences in the College of Food, Agricultural, and Environmental Sciences at The Ohio State University (CFAES) has been named a Diplomate of the American College of Animal Welfare, the only swine veterinarian in Ohio to earn such a designation. In fact, Monique Pairis-Garcia, who is also an animal welfare specialist with Ohio State University Extension, is the first veterinarian at Ohio State to earn board certification in this relatively new veterinary specialty. OSU Extension is the outreach arm of CFAES. Pairis-Garcia earned her Doctor of Veterinary Medicine degree and a PhD in animal physiology from Iowa State University. She earned a scholarship from the American Association of Swine Veterinarians to take the exam for the board certification in animal welfare. Her research at Ohio State focuses on animal welfare issues for livestock species including timely and humane euthanasia, on-farm welfare assessments and audits, and alternative management practices to improve animal welfare on-farm. She also teaches CFAES undergraduate students and College of Veterinary Medicine veterinary students, focusing primarily on animal welfare and behavior in livestock industries. 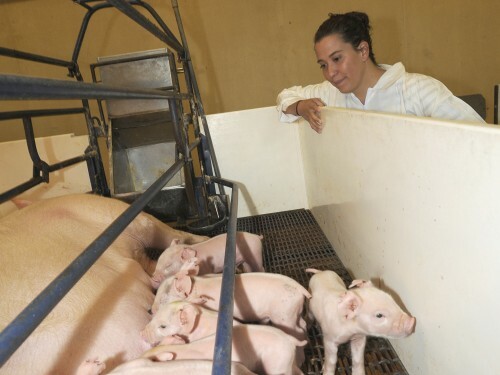 In addition to teaching and conducting research, Pairis-Garcia serves as a consultant, working with livestock producers to improve animal welfare on farms, including swine, dairy and poultry farms. For example, if an undercover video surfaces alleging suspected animal abuse or standards violations, Pairis-Garcia may be called to visit the farm to conduct an animal care audit. If violations are found, she works with producers to correct the animal care conditions. Her new board certification in animal welfare demonstrates her expertise in the area, which is a key focus for producers in maintaining their social license to produce food, she said. “I work to help producers provide an environment for their animals that optimizes their health and well-being,” Pairis-Garcia said. “When we recognize the role that animals have in our lives – whether it be the human-animal bond with pets or those relationships we have with livestock, it is our duty to take proper care of them when they are in our care. Not only is it the right thing to do on a humane level, Pairis-Garcia said, but it’s also beneficial from a production standpoint — good animal welfare is key for quality food production. To prevent that from happening, producers have to focus on proper animal handling, including remaining calm and quiet when they move animals, Pairis-Garcia said.